Discover the beautiful Baie de Somme, a UNESCO World Heritage site on the Picardy coast. Open water, marshes, dunes and saltwater meadows make up a landscape where water and dry land seem to merge. It is one of France’s major sites for migrating birds. You can choose to begin your holiday any day except Sunday. Arrive in Noyelles-sur-Mer and start the tour in the elegant Château de Noyelles, set in a large garden with a greenhouse and orchard. Château de Noyelles, set in a large garden with a greenhouse and orchard, is a classically decorated hotel with marble fireplaces and ornate glass mirrors, offering elegant accommodation. Each guestroom is unique in décor with carpeted floors, a bathroom and work desk. Situated in the centre of the village of Noyelles-sur-Mer, the hotel is just 5 minutes walk from the station and only 6 km away from the bay and ports of Crotoy and Saint Valery. Breakfast in your room is available. This is not a classic gourmet restaurant, but a table d'hôte with excellent food -.they offer a dining experience as if they were cooking for friends. Dinners are served by candlelight in the elegant dining room. The menu of the day is unique with a choice of two starters, two main courses, a cheese plate and two choices of desserts. Enjoy an aperitif in the salon where an honesty bar is permanently open. Coffee, digestive and infusions are available after the meal. Cycle through the medieval town of Rue and along countryside roads and cycle paths. Pass through the remarkable landscapes between the Baie d’Authie and the Baie de Somme, the largest stretch of dunes in Northern Europe. Stay at the hotel Le Fiacre, a 3-star hideaway with a swimming pool. Don’t miss an early evening stroll by the sea at Quend or Fort-Mahon. Ideally situated in the Picardy countryside, on the Somme bay, the hotel/restaurant Le Fiacre offers you the welcome and service of a 3-star establishment whilst retaining the simplicity of an old farmhouse inn. Close to the beaches and sea (3km) between Quend and Fort Mahon in the middle of Marquenterre country, the Le Fiacre is a place of relaxation and peace. They aim to provide a relaxing atmosphere all year round, with wood fires in the winter and a heated swimming pool and delightful gardens in summer. The restaurant, Le Fiacre, offers different menus that feature the fish from the coast, the salt-marsh lamb and game in the autumn. Menus and a la carte dishes vary according to the season and market produce. To accompany your meals there is a rich and varied list of wines and spirits. Today, follow the paths through the lush pine forest and admire the sea views before heading south. Arrive at the fairytale Hotel Les Tourelles in Le Crotoy, with direct access to the beach, and take in the view of the bay as you dine in the restaurant. Le Crotoy is positioned north of the Baie de Somme and is a charming sea resort with an extensive sandy beach. With direct access to it, the Hotel Les Tourelles, in a quiet corner of the small town, is in an ideal location. The building, painted in red, has a very distinctive shape with small towers and has become symbolic of Le Crotoy. The front terrace, where you can have a drink or a meal, has a panoramic view of the Baie de Somme. So has the restaurant if you prefer to eat indoors. All 35 bedrooms have en suite bathrooms. The decoration is very tasteful, in light and natural tones and materials. Some have a view of the sea and others have a view of the village. Meals can be taken in the restaurant or on the terrace facing the bay. The restaurant serves traditional French cuisine and seafood. Packed lunches can be ordered. Spend some time on the beach and visit the town before cycling along the bay or following the ‘Circuit du Héron’ through pretty villages. Arrive at the port of St-Valéry-sur-Somme with its medieval character and defensive ramparts. Stay at the 3-star Hotel Picardia. Located in the medieval city of Saint-Valery-sur-Somme, on the south side of the Baie de Somme, the Hotel Picardia was built in the 19th century (1873) and has been tastefully renovated. A step away from the old town and the ramparts, it is also very close to the embankment where the view of the bay is stunning. The hotel only serves delicious breakfasts with home-made bread, fresh fruits and pastries. Packed lunches prepared with regional products can be ordered in advance. Excellent choice of restaurants in Saint-Valéry-sur-somme and we can advise and help you to choose. Pack your binoculars and head for la Pointe du Hourdel, with its spectacular views. You might be lucky enough to spot seals resting on the sand. Bird lovers can stop at the Maison de la Baie de Somme. 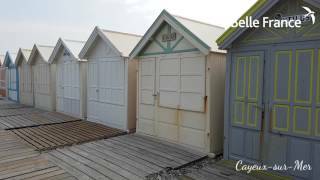 Passing Cayeux-sur-Mer and its beach huts, return to Noyelles-sur-Mer where you’ll stay in the Château de Noyelles. On several occasions you will have the opportunity to get on board the Baie de Somme steam train with your bike to reach your destination with very little effort. Add an extra night in Favières to spend at the wonderful parc du marquenterre, a reserve for migrating birds and a haven for wildlife enthusiasts. Hides on different paths enable you to discover the variety of species. Stay at the 3-star Hôtel les Saules, half board. Please call for details. Add a night in Saint-Valéry-sur-Somme to visit the old town or cross the Baie de Somme with a guide. Available to those travelling by car. Please call us for details. Outward Depart St Pancras International station, change trains at Calais Frethun arrive Noyelles mid afternoon. Return Depart Noyelles mid morning change stations in Paris. Arrive St Pancras International late afternoon. Sometimes possible to take an early train from Noyelles via Calais Frethun.